What is the Power of a Story? Stories are powerful. They have the ability to entertain, make people laugh, preserve the past, teach, and inspire. Some are heart wrenching tales of tragedy or despair, while others are written to uplift, entertain and educate. Over the last few weeks since my return home. I have found that this thread of stories has been running through all that I do. Whether it is reuniting and coming together with old friends to re live tails from the past or spending time with family talking about when we were children or the early days of parenting. News stories like the Thai soccer players rescued from the cave in Thailand or stories of triumph from the World Cup. Reading my favourite book by the pool, at the beach or on the front porch. Stories are a vital part of our lives. Some of us have more interesting narratives than others or the power to tell a story in a way that captivates an audience. This quote is in relation to the story of when Alvin Fiddler the grand chief of the Nishnawbe Aski Nation received the news that Jordan Wabasse’s a missing teen’s body had been found. He had spend the entire day prior to the phone call listening to the stories of residential school survivors. He was tired and emotionally drained. Not all stories are positive, uplifting and entertaining. Some are difficult, tragic, and traumatic. Some highlight the mistakes of our past or experiences we are not particularly proud of. What is our responsibility to share these stories? How do we make sense of them? How do we use them as lessons so that the same things do not continue to happen? How do we learn from them? As school leaders especially those in difficult schools we hear many difficult stories. Stories of poverty, abuse, neglect, and hardship. Although these stories are important and needed to have a deeper understanding of your students and families they begin to take their toll over time. How as leaders do we listen and learn from these stories while preserving our own mental health and wellness? How do we use them to support teachers in understanding and connecting with their students? I also ran across a tweet this week while scrolling through my Twitter feed. 1. The power of a story to make an emotional connection. Whether that is to our community or to the students or parents that we serve. 2. 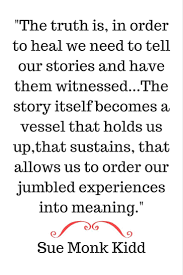 The importance of telling our story as a school. 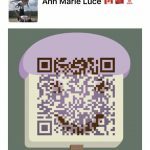 What is it that we want our community to know about us? About our school? About what we value? I have heard @Joe_Sanfelippo speak at a Leadership EdCamp and he talks about the power of telling your story as a school. The concept if we do not tell our story than others will. I do not want to trivialize or compare the stories of indigenous youth, or residential schools to the stories of school leadership. 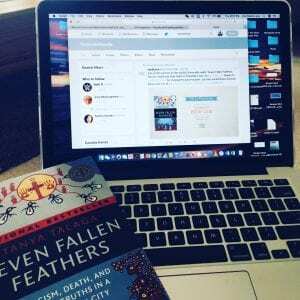 What I have connected to in reading this book “Seven Fallen Feathers” is the power of the story. The need to share what has happened in our past, what is happening now so that generations before and after us understand and appreciate the impact of our experience on who we are as individuals and as a society. People love stories. They will listen and respond. How can we use the power of stories to influence our world?